When I first read this comic strip, I laughed. But actually, it’s not very funny. Prayer has lost its prominence today. We have lost our desire to pray, and out understanding of how to pray. Today we are going to look at the prayer of Jonah. You can learn a lot about prayer, both how to pray and how not to pray, by studying the prayers of key people in Scripture. We’re going to look today at the prayer of Jonah. To see this, we’re going to look at the prayer of Jonah twice. The first time, we are going to look at it by itself. We are going to look at it out of context. As I read the prayer, try to forget everything you know about Jonah, and everything we looked at in Jonah 1. The Wonderful Prayer of Jonah? Now, when we read the prayer out of context, it looks like a pretty good prayer. It looks like a prayer we could all learn from. And we will learn from it. We learn from verse one that Jonah is inside a big fish, and that he is praying. In Jonah 2:2-6 we see that when Jonah was in trouble, he called to God. In Jonah 2:7, just before Jonah dies, he remembers God. In Jonah 2:8-9, he promises that if God (who is the only true God) saves him, he will make sacrifices to God. 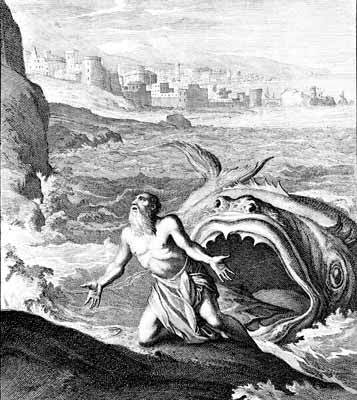 In the last verse of Jonah 2, we see that God caused the fish to vomit Jonah up onto dry land. Apparently God did listen to Jonah and apparently God granted Jonah’s request. So we read this prayer out of context, and think that it’s a pretty good prayer because his prayer was answered. Therefore, it must be a good prayer, right? In fact, many who have studied Jonah, think that it is a wonderful prayer. I used to be one of them. I remember when I was in college, I led a Bible Study on Jonah 2 and how it was a good example of what makes a good prayer. Most people you will run across today think that Jonah’s prayer is great. The reason they think this is such a wonderful prayer, is because either they are reading the prayer by itself, or they have read ahead in the story and then gone back and looked at the prayer. But we know that stories are not to be read this way. You do not read a novel this way, by reading the middle chapter, and then the end chapter, and then going back and starting at the beginning. No, this would ruin the story, and it would ruin the story of Jonah as well. You want to let the story of Jonah tell you what the author is trying to say, and the only way to do this is by reading the story in context and reading the story in sequence. Maybe there is a better explanation of the prayer; one that does fit Jonah’s personality here and one that does fit the flow of the story better. And to find this explanation, we must look at the prayer in context. Generally, Jonah is thought to be a book about how Jonah went on a missions trip, and so should we. While Jonah is about going on a mission, it is not the main focus of the story, nor is it about missions in the way that most people think. To discover what the lesson might be, we need to look at the story as a whole so that we can discover the lesson God wants us to learn from Jonah. Chapter 1 brought up many questions about Jonah’s character and conduct. We saw that Jonah was a popular prophet in Israel. We saw that it was a good time for Israel. We saw that the only problem during this time was that Israel had a rival country off to the east. This rival was Assyria, and the capital of Assyria was Nineveh. We saw that Nineveh was a very wicked city, and that God asked Jonah to go preach to it. Now normally, a prophet would be overjoyed to do such a thing, because throughout the history of Israel, God had shown that if a nation was wicked, it would be destroyed. So Jonah should have been overjoyed to go. But instead, he went the opposite direction, to Tarshish. We had to wonder why. This was our first unanswered question. Why would Jonah not want to preach fire and brimstone to Nineveh, the very people he despised? Well, God doesn’t take disobedience too well, so He sent a storm that about sunk the ship. Jonah was sleeping while the sailors were praying, and we saw that it seemed to us that Jonah wanted to die. Anyway, it turned out that the sailors threw Jonah overboard, certain that Jonah would die. Did Jonah get his wish? Did he die? Well, we saw from the last verse in chapter 1 that he did not. He was swallowed by a fish and left there for three days and three nights. But, and this is key as we continue on with the story today, this is information that Jonah does not have. We have been told that Jonah will survive, but Jonah, in the belly of the fish, still thinks that he is going to die. Remember, he doesn’t know (but we do from Jonah 1:17) that he is going to get out of the fish. Jonah 2:1. Then Jonah prayed to the Lord his God from the fish’s belly. Jonah 2:1 gives the setting. We find ourselves with Jonah in the belly of the fish praying to God. This is key, because remember in chapter one, we saw everyone praying to their false gods while Jonah remained silent. He did not want to pray because he was in disobedience to God. Oftentimes, you may find, as I have, that when we are in rebellion against God, prayer is the last thing we want to do. Developing the discipline of prayer is hard enough. But disobedience can really hinder our progress. Anyway, we now see Jonah turning to God in prayer. Maybe Jonah has repented of his ways, and now wants to restore his relationship with God. Let’s see what he prays. This seems like a good start. It is always good to start a prayer with adoration of God and thanksgiving for what he has done. Jonah here is praising God for saving his life and keeping him from dying. From the second part of verse 2, it seems that for a while, Jonah thought he had actually died. When he refers to the belly of Sheol, that is a Hebrew way of referring to the place of the dead (Ps 18:4-5; 30:3). And now he seems glad he did not die. Earlier in chapter one we saw that he would rather disobey God and face divine judgment than simply do what God had asked. And now we see that this situation was scary for him, as death is for many people. He was greatly distressed about death. But the question remains, why didn’t Jonah just preach fire and brimstone to Nineveh and let God destroy it as God did with the people at the time of the flood and to Sodom and Gomorrah? Maybe the rest of the prayer will tell us. Jonah expands on verse one, and tells what happened to him when he was thrown into the sea and was about to drown. Notice that he does not place the blame on the sailors, but says that God hurled him into the deep. The sailors may have done it, but it was God’s hand of discipline behind their actions. To be in the sight of God essentially means to be within God’s favor. 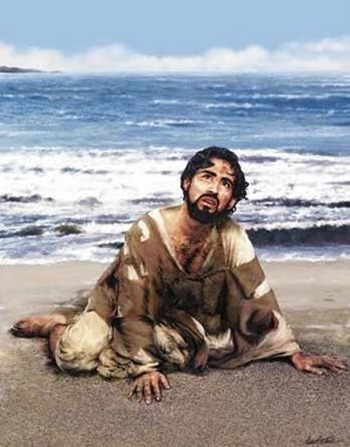 Jonah realized he had broken his relationship with God; he had lost God’s favor. Nevertheless, Jonah will pray to God. When he says he will look toward the temple, that means he will pray. Jonah continues to talk about himself and what happened to him in verse 5. Basically, Jonah was on the verge of death. He was on the threshold of dying. Continuing in Jonah 2:6. Here is the reason Jonah is praying. Jonah is thankful that he did not die, and this is a good thing to be thankful to God for. Maybe now that Jonah’s life has been spared, he will be willing to do what God wants and go preach against Nineveh. Maybe he will now pray for forgiveness and confess his rebellion against God. But we find no confession in verse 7. Here, just when we thought Jonah was going to repent of his sin, and praise God for doing something wonderful, Jonah continues to focus on himself. And it seems that he thinks that the only reason God spared his life is because of his own prayer. I remembered you, LORD, and my prayer rose to you. We often hear about the power of prayer and the effectiveness of prayer, and how prayer accomplishes much; and it does. The book of James says that the prayer of a righteous man is powerful and effective. But we must always remember that it is not the prayer that is powerful and it is not the prayer that does the work. Prayer is not a magical spell that we use to control God and get what we want. Prayer never does anything by itself. It is always God who does the work. It is God who answers prayer. It is God who is powerful, and it is God who provides and protects. Jonah is focusing here on himself and his prayer, rather than on God and what God wants. Well, there are still two verses left to Jonah’s prayer. Maybe he will turn his focus toward God now. Jonah, Jonah, Jonah. Do you see what he is doing here? Have we seen any mention of idols or false gods so far in the story of Jonah? You bet we have. When Jonah was on the boat with the sailors and the boat was going through the storm, what were the sailors doing? They were calling out to their gods for help. Jonah, do you hear what you are saying? Jonah, who are you worshiping? Yourself, or the LORD? Jonah, you talk about those idol worshipers forfeiting the grace that could be theirs, and yet do you know anything about grace? God is keeping you alive when you should be dead. God has been more gracious to you then you deserve, and you still cannot be gracious to others. Not only does Jonah feel disdain for the gentile sailors, but it seems that he might also be looking at what God wants Jonah to do: go and preach to the people of Nineveh. It is as if he is saying “God, look, they’re idolaters too. They might turn and they might not, but even if they do, they will just go back to their idols. You don’t understand them God. They’re a hopeless cause.” Are there people that you view as hopeless? Are there those whom you think God will never be able to get through to? (Contrast with Psalms 22, 67). Is this the feeling we sometimes have toward our unsaved neighbors or the people we work with? Do we feel superior to them because we are Christians and they are not? What a horrible attitude and what a horrible witness! It is a horrible attitude because the only reason we are Christians is because God wanted us to be. It has nothing to do with anything that we have done. We are going to heaven only because God was gracious to us. It is a horrible witness because it turns off others to the Gospel. If we treat others as if they were rubbish, why would they want to become one of us? You know, people are watching you and what you do. Wendy and I worked at a restaurant seven years ago, and do you want to know who the worst customers were? The worst customers were Christians. Every time the waiters saw one of their tables praying over their meals or someone at their table wearing a Christian T-shirt, they groaned. I groaned also. You want to know why? Christians were some of the most demanding, rude, messy, and arrogant that came into that restaurant. Not only that, but they gave the worst tips. Are you a trouble causer and a complainer at work? Are you lazy and irresponsible? Do you judge and condemn your co-workers for being immoral? People are watching, and people notice. How you live and what you say to non-Christians can determine whether or not they will ever be interested in coming to church with you or listening to a presentation of the gospel. Watch what you say and what you do, and what attitudes you have. They matter more than you know. Well, Jonah continues in Jonah 2:9. Jonah continues to condemn the sailors. Remember, they sacrificed to God also, and made vows to him (Jonah 1:16). Jonah is hinting here that their sacrifices were worthless because they did not know God very well. He is also hinting that although they made vows, they will not keep them, whereas Jonah will. And look what Jonah vows. He does not vow to obey God and go to Nineveh, but rather to go the temple in Jerusalem and make a sacrifice to God. Apparently Jonah did not know or remember Scripture as well as we had hoped. Jonah may not sacrifice to idols, but he didn’t obey God, and God wants obedience more than anything else. Remember the story of the Pharisee and the Tax collector in Luke 18:10-14? The Pharisee thinks he is so righteous and prays to God, “God, thank you that I am not like this sinner.” Jonah is like the Pharisee in this story. He is so self-righteous that he does not see that he has really done anything wrong. He focuses his prayer completely on himself. I went through and compared Jonah’s prayer with that of other prayers in the Bible. Daniel 9 is a good example. Daniel’s prayer is full of confession and repentance and thanksgiving for God and focusing on what God has done. There is a lot of focusing on himself and his country, but it is always in reference to their sin, not to their goodness. Also, he puts himself right in step with the worst of them. Daniel, the righteous man of God, puts himself in the same category as all of Israel who were worshiping false idols. Daniel’s prayer is good example of how we should pray. The book of Psalms is another good example. I took several of the Psalms and made a word frequency list. There are roughly 42,000 words in the book of Psalms. A little over 2,500 of those are personal pronouns (I, me, my, we, our, us etc.). If you ever wonder how I spend my time in the office, now you know. No, actually, I have a computer program that does this for me. So, 2500 of 42,000 is between 5 and 6%. Now, of those, a majority are in repentance or confession for personal or national sin. Now, Jonah 2 has 201 words. Of these 201 words, 24 are personal pronouns. That’s 12%, twice as many times as the Psalms, and not one is in reference to repentance or confession for his rebelliousness against God (cf. Psalms 32, 50, 51). We may be deceived by the terminology employed by Jonah, much of which is borrowed from the Book of Psalms (18, 42). But when we compare the theology of Jonah’s “psalm” with that of the Psalms, the shallowness and inferiority of Jonah’s praise is quickly evident. Jonah focuses on himself throughout the entire prayer, his needs, his worries, what he has done, how righteous he is in comparison to the nasty sailors, and how he will keep his vows and how he will make a sacrifice to God. In the Book of Psalms, on the other hand, the psalmists also describe their deliverance, although particulars are generally left out, and then quickly turn from their personal experience to the character of God. In short, the Psalms are God-centered, while Jonah’s prayer is self-centered. So we feel disgusted with Jonah’s prayer. Jonah has been thinking about himself all the way through, and now God saved Jonah from dying and still Jonah can only think about himself. But do not judge Jonah too quickly. How is your prayer life? What (or Who) do you focus on? Do you start with praise or do you jump right into what you want and what you need? Prayer is a difficult thing, and all of us need improvement in it, including myself, and we can learn better how to pray by studying the prayers in Scripture. Jonah shows us here how not to pray. Do not pray focused on yourself and you goals and needs. Pray focused on God and what he wants for your life. To not make promises to God in order to get what you want, and do not be too quick to judge others in your prayers. For in the same way you judge others, you also will be judged (Matt. 7:2). And so we close this chapter on prayer with Jonah 2:10. Jonah 2:10. So the Lord spoke to the fish, and it vomited Jonah onto dry land. God has been trying to teach Jonah something, and Jonah is just not getting it. So now we have a new question. The first unanswered question is “Why did Jonah not want to go to preach fire and brimstone to Nineveh?” The second question (related to the first) is “Why would Jonah rather die than do what God wants?” and the third question, the question we ask based upon Jonah’s prayer and God’s response is, “What is God trying to teach Jonah?” We saw that God is sovereign, and so we can expect that His lesson will be taught. What can we learn from Jonah’s prayer today? It relies on the wrong things: background, ancestry, denomination, position in church (elder), knowledge, amount of time you give or money you donate, maybe simply that you go to church. It is heavy on forms. It mimics rather than is genuine. It prays only in dire circumstances. It is selfward rather than Godward or manward. It insensitive to the needs and concerns of others, yet lets everyone know of its own needs. It looks over one’s own sin, while at the same time points out sin in others. It lacks intimacy with God and has little evangelistic desire. 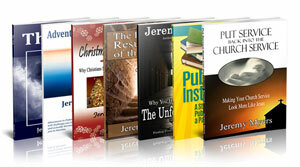 It tends to distort doctrine and gives excuses for personal sin. So we can beware of spiritual shallowness. Second, we are reminded that God’s method of saving us is not always the method we would have chosen. Jonah would have much preferred a dramatic search effort, with Coast Guard ships, helicopters, and skin divers. Of course, he would have wanted television coverage, piles of support letters as he recovered in the hospital and an interview with David Letterman after he left the hospital. But God did not choose to do it this way, because one of Jonah’s main problems was pride. Neither does God choose to save us in the manner we might choose. Believing in Christ alone that he guarantees you eternal life simply for doing so is not what man would have chosen. And in fact, many still try to add things to this Gospel such as good works. Nevertheless, this is the means God has provided for man’s eternal salvation. This is the only means. It is by this provision alone that you may be saved. May God keep us from the shallow spirituality and personal pride of Jonah’s prayer. Bob Deffinbaugh on Jonah 2. Constable’s Notes on Jonah, p. 4. Thank you for this great analysis. This strikes me to the core. I see myself in Jonah and am disgusted. Oh, don’t be disgusted. Smile and laugh at yourself! Disgust only leads to shame and guilt and fear. God simply wants us to see ourselves as we truly are, and then know that we are still loved, no matter what. Change only comes from a position of knowing we are loved. Puzzled at this commentary on Jonah’s prayer. From my perspective, I can’t see one thing wrong with it. I don’t see any sin. I don’t see any false statements. I don’t get why 2:8 is so objectionable. Doesn’t God frown upon idols? Isn’t Jonah a prophet? Is it really wrong or sinful or bad for prophets to speak against idolatry? Is it impossible to think that, perhaps God inspired/wanted Jonah to say just that in His prayer so the account would be preserved as an example/reminder for others? Don’t we expect prophets to do/say those kind of things? The real idolatry here is the idolatry in Jonah’s heart of his own superior spirituality over that of the sailors. This spiritual pride is at the heart of all religious thinking. Thank you very much for such an in-depth share. I learn much. I am not deserved for I have been travelling far more than Jonah’ disobedience. Yet, God’s merciful..
Are you judging jonah for his disobedience and his prayer? What is really your point here? There is no judgement. The point is you (we) should learn from Jonah to obey God, and to share the free offer of Gospel to the world as God wants you (us) to do, with merciful and rejoicing hearts for the repentant sinners. Salvation belongs to the Lord. Wonderful…I once wrote a paper for a theology class about the “madness” of a Bible character and chose Jonah. YOU did a much better, more thorough job. Many, many thanks!! !